Top models, dream places and sport cars are continuously used by the Fashion and Luxury Industries to bond consumer dreams with their products. But for motorcycles, advertisers are much more shy and selective in their choices, preferring by far the Classic bikes. Thus it is quite ineluctable that the Egli-Vincent takes part to the game, and after Alfred Dunhill (1), this is now the turn of Yves Saint Laurent to use Patrick Godet’s Egli for its latest commercial, “L’Homme Sport”, starring the model Olivier Martinez (2)(3). 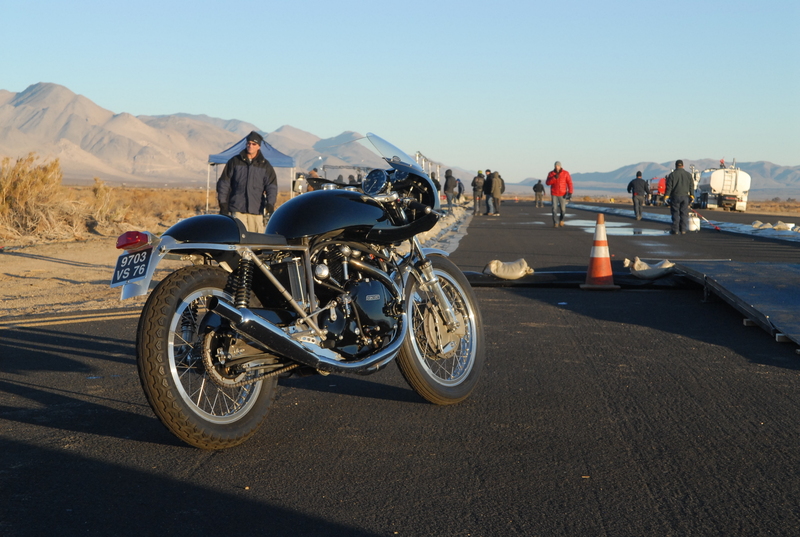 This machine belongs to Mars Webster and was previously featured beside Rollie Free’s bike at Bonneville. I called Mars in order to know what was the story about this shooting and how was he contacted by YSL. “Everything started at The Garage Company “(4), said Mars, “a place that you need to visit if you are coming through southern California”. Indeed, many of Mars’ bikes are on display at Yoshi’s place (4) and in preparation of the commercial, this is how Olivier Martinez spotted the bike. Then, YSL headquarters contacted Patrick Godet who referred them to Mars. Soon after, Julien Lemaitre, the producer (5) contracted by YSL, contacted him to explain what he was looking for and sent him the storyboard. Eventually Mars accepted their offer but under the condition that he will transport the bike to the shooting venue and will also look after the bike. This was a done deal and 3 days were booked in December 2013 for the shooting at Inyokern Airfield, CA. 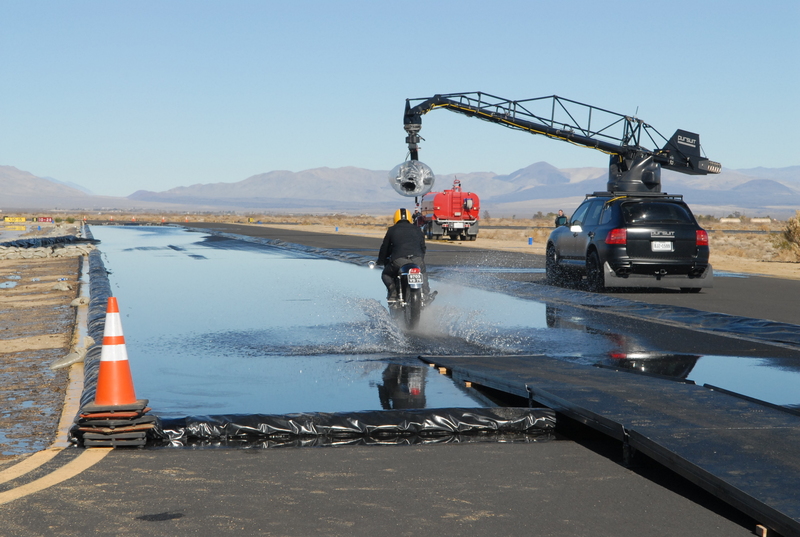 Day 1 was booked for the still shots and Mars recalls that it was below freezing. All the crew was on the deck at dawn to capture the early sunlight, and Olivier Martinez was of course the center of the attention. At the end of the shooting, Mars met the stunt driver, Vladimir Tevlovski, and briefed him about the bike before riding it to get familiar with. Mars recalls, “Vladimir also understood the temperament of the vintage bike”. When he returned, Olivier asked to make a short ride. Then the photographer also requested an opportunity to try the bike. It was a brisk run that became the most stressful event of those 3 days…. Indeed, firstly he rode the bike on a portion of the active runway, alerting the all airfield security and secondly, on his return, the bike was stuck in 4th gear with the throttle wide open. Story short, the bike was not operational any more, while the motion shooting had been scheduled first thing in the next morning. Mars pushed the bike back to his truck in order to diagnose the issue. “Soon a large crowd was surrounding me and the bike and I can tell that I never felt so much pressure in my life” said Mars. Fortunately, the production had hired the assistance of a mechanic, John Landon (6), and after forty long minutes the problem was fixed. “Although the problem was minor, I am grateful John arrived on location with perfect timing as his support helped to greatly relieve my stress” said Mars. Julien the producer, who was standing a few dozen yards away from Mars, looked at him in the eyes with the thumb up, expecting in return either the sign of “victory or death”. But next in the picture was Vladimir the stunt rider who was also an experienced and great rider, so Mars was confident to return a thumb up. Day 2 was “the” day of the motion shooting. When Mars arrived, he noticed that the production had found in extremis a black Norton Commando to serve as a back up, “just in case”. No need to say that the stress and doubt were still there, all around the place. But that particular morning, another concern was gliding above all heads: It was freaking cold, 23⁰F or -5⁰c, and as the Porsche Cayenne camera-car had to move quite close to the bike, for safety reasons it was a “no go”. The “client” started to be worried about the consequences of a cancellation and the place was incredibly quiet in this early morning; eventually when the temperature reached 27⁰F (-3⁰c), the producer assessed that the risks were manageable and “gave a go”. 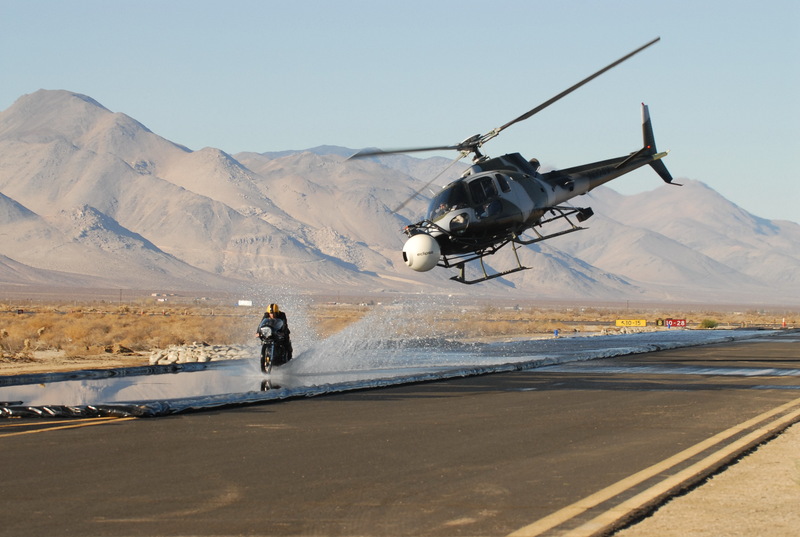 The three tankers started to pour water on the runway, which had been carefully prepared and sealed to retain the 4 to 6 inches necessary so the Egli could give the impression it was flying on the water surface: The show could start, first with the Porsche Cayenne and then with the Helicopter. 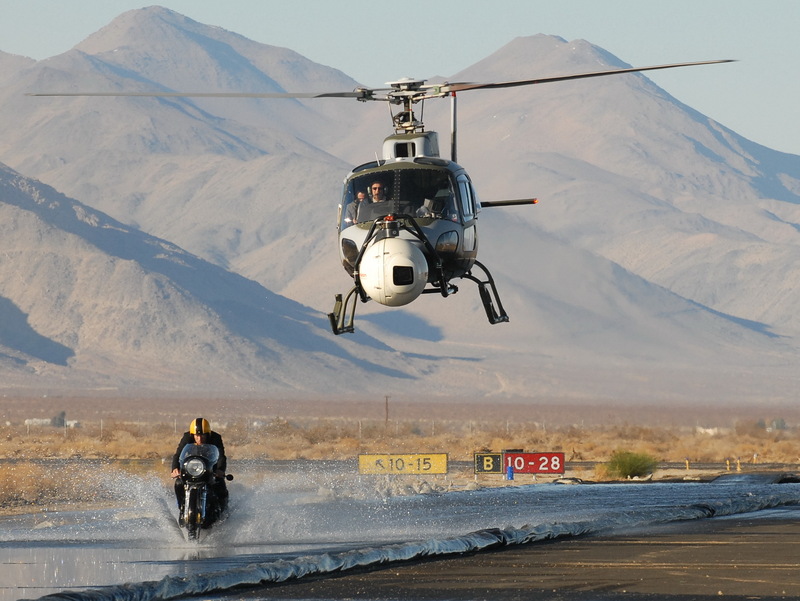 “The chopper was a dramatic footage and definitely the best shooting of the day. My Egli worked perfectly, despite the heavy projection of water on the engine” recalled Mars. The day went great, the Norton stayed in the shadow and everyone was happy and relieved. Day 3 was the trolley-car day with no particular challenges compared to the previous days; the bike was clamped on a trailer carrying the all crew with camera, spotlight, and reflectors, the all thing in motion on the runway just for a few seconds of close up on Olivier Martinez’s face. And Mars to conclude, “It was a fantastic experience but I was not prepared for that kind of pressure. When you see the amount of logistic and the costs involved for these shootings, I realize that they were just expecting me to be as professional as they are. However, I am pleased that the word of the end came from the team itself, who has nicknamed my Egli, “The Hero Bike”, this was sincere and comforting”. After the misadventures of the first day, the Egli is ready to face the challenge and fly on the water. Day 2: it was freaking cold and the production had to wait the temperature reached 27⁰F (-3⁰c) to run the show. Vladimir, the stunt rider is now ready for the first ride. You can see in the “making of the video” how close they can be during the shooting (2)(3). It is not “Mission:Impossible”, although it could be; the chopper chases the Egli at good speed, capturing the essence of the commercial message “Freshness, Elegance, Shiver”. After the postproduction, the effect is striking (2)(3). The trolley-car welcomes on board a fairly large amount of equipment and technicians. 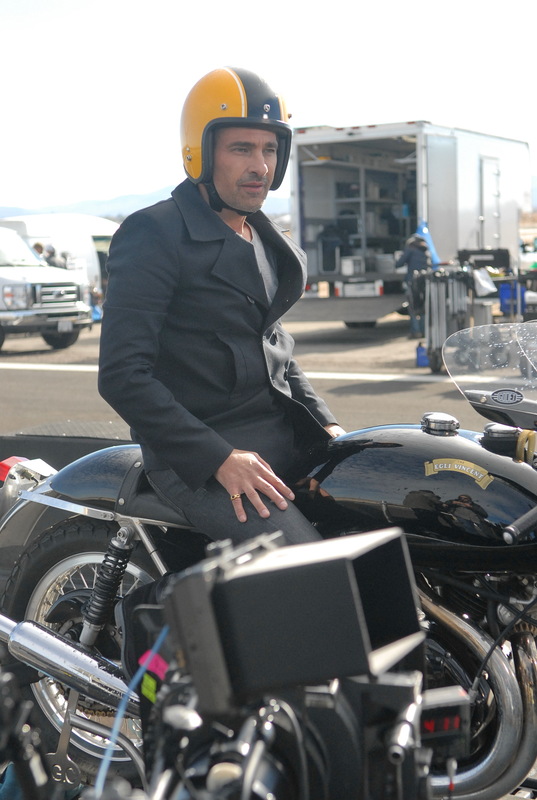 Olivier Martinez on the Egli for a few pictures before the trolley-car goes on the runway for the close up shooting. 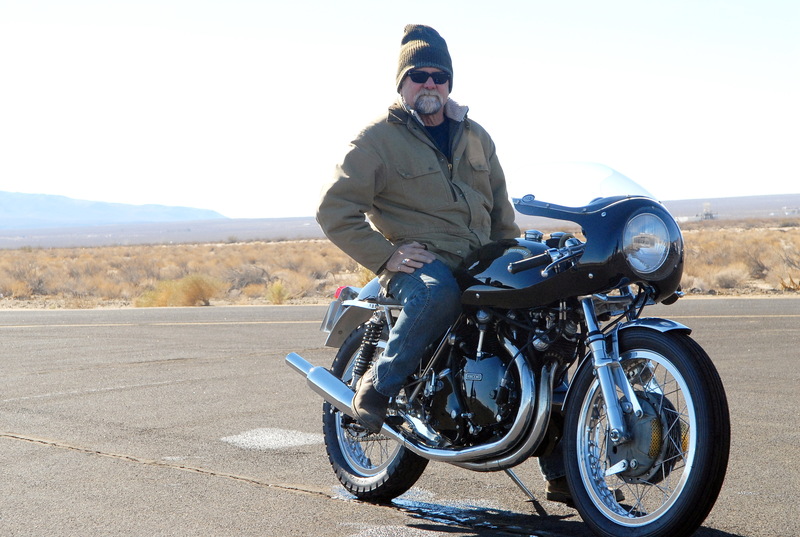 Mars Webster and his Egli built by Patrick Godet. I would like to thank Mars for his availability to answer my questions and for supplying the pictures, which are included on this page. (5) Iconoclast was contracted by YSL to produce this commercial. (6) John Landon is a professional mechanic who maintains all the motorcycles for the TV show “Sons of Anarchy”. Nice one . Five stars and a huge two thumbs up . Now if you would good sir a more detailed follow up on the bike itself ?